What an interesting finish it was Sri-Lanka Women have almost won the match against Pakistan Women but the last ball four by Fatima took the game from Sri Lankan girls. In Today’s Dream11 Fantasy Cricket Prediction PK-W v SL-W 2nd T20 we will analyze and provide you all the important details of the second T20. Our analysis will include pitch report of Nondescripts Cricket Club Ground, players recent and past performance, playing condition, likely 11, weather report, best team for dream11 and other fantasy leagues, key players, who will win the match, previous match dream team, and what astrology has to say about the toss. The above information is very important to have before making any team in fantasy leagues. If you want to win every match and increase your chance to 100% then make sure you don’t miss any details. These data are accurate data which we gather after deep research. Who Will Win the 2nd T20 Between PAKW vs SLW on 30th March? Date: 30th March 2018 (Friday). 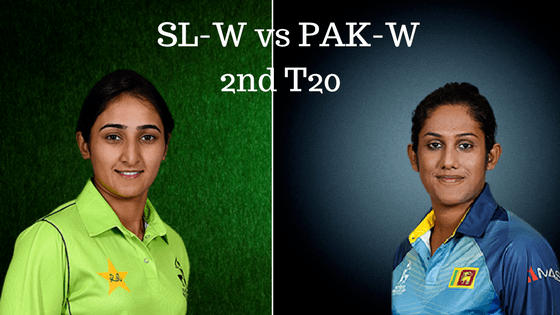 Match: Pakistan Women tour of Sri Lanka, PK-W v SL-W, 2nd T20, 2018. Venue: Colombo, Nondescripts Cricket Club Ground. Nondescripts Cricket Club Ground has not hosted any international matches but it is known for producing finest players in the cricket history including Kumar Sangakkara and Aravinda de Silva. The is expected to be batting friendly and spinners may get some help from the pitch. Seamers may get some help initially. In last five matches, Sri Lankan girls have won 2 games out of 5 games whereas PAK girls have won 3 matches out of 5 matches. Pakistani players have strongly dominated Sri Lankan girls in recent past. It will be interesting to see how Sri Lanka Women will react after the close first encounter. Before the start of the match, rain is expected in Colombo but it will not affect the game. It is expected to be partly cloudy at the time of the play. The temperature will be 30-Degree Celsius and humidity is expected to be 76%. Nahida Khan, Bismah Maroof (c), Javeria Khan, Sidra Nawaz, Sana Mir, Fareeha Mehmood (wk), Nida Dar, Nashra Sandhu, Aiman Anwer, Ghulam Fatima, Kainat Imtiaz, Sidra Ameen, Muneeba Ali, Natalia Pervaiz, Diana Baig. Nipuni Hansika, Chamari Athapaththu (c), Prasadani Weerakkody, Kavisha Dilhari, Rebeca Vandort (wk), Imalka Mendis, Sripali Weerakkody, Inoshi Priyadharshani, Hasini Perera, Ama Kanchana, Inoka Ranaweera, Shashikala Siriwardene, Chamari Polgampola, Sugandika Kumari, Nilakshi de Silva, Achini Kulasuriya, Udeshika Prabodhani, Dilani Manodara, Anushka Sanjeewani, Oshadi Ranasinghe. The team below is a dream team of the previous match played between Pakistan Women and Sri Lanka Women. This team won the grand league. You can take reference from this team. The demo team for PAK-W v SL-W is below in this post. Maroof, Javeria, and Ghulam Fatima saved the last game else Pakistan Women could have on another side of the result. There will be no change in PAKW team. They will play with same playing 11. Nahida Khan, Kainat Imtiaz, Bismah Maroof (c), Natalia Pervaiz, Diana Baig, Javeria Khan, Fareeha Mehmood (wk), Nashra Sandhu, Ghulam Fatima, Nida Dar, Sana Mir. They almost have won the match but better luck next time. Few of the top order batsmen are underperforming and it’s a big concern for Sri Lankan girls. With only one game passed they might not think of changing the team. Athapaththu will play with same playing 11. Chamari Athapaththu (c), Nilakshi de Silva, Ama Kanchana, Shashikala Siriwardene, Rebeca Vandort (wk), Hasini Perera, Sugandika Kumari, Udeshika Prabodhani, Oshadi Ranasinghe, Anushka Sanjeewani, Imalka Mendis. Rebeca Vandort: In last four matches she scored 79 runs in T20s. In the last match, she scored 5 runs and contributed 16.5 points. 78.9% of the dream11 users have selected her in their dream team. Fareeha Mehmood: Mehmood scored 2 runs in the last match and contributed 7 points. 15.56% of the users have selected her. Pro-Tips: Try to keep Vandort in your in your team as she gets more ball to play and she is a better option than Mehmood. Javeria Khan: In last 5 matches she scored 132 runs and took 3 wickets. In the last match, she contributed 36 points and scored 52 runs. 86.04% of the users have selected her. Bismah Maroof: In the last 5 games she scored 92 runs. She scored 42 runs in the last inning and contributed 30 points. 84.51% of the users have selected her in their team. Nahida Khan: She scored 91 runs in last five games. She contributed 3 points and scored 2 runs in the last inning. 55.83% of the users have taken her in their fantasy teams. Anushka Sanjeewani: She scored 61 runs in the last match and contributed 30 points. 47.05% of the users thought of taking her in their team. Pro-Tips: Try to keep all the above four batsmen in your team as they are very important player almost perform on any day. You can make a combination from the playing 11 also. Shashikala Siriwardene: She has scored 61 runs in last 5 matches and took 2 wickets. She scored 2 runs and took 1 wicket and contributed 13 points. 33.44% of the users have chosen her. Chamari Athapaththu: In last 4 matches she scored 41 runs and took 1 wicket. One of the most important player but underperforming in a couple of matches. She scored 10 runs and contributed 13 points. 59.05% of the users have taken her in their dream team. Sana Mir: Lady in form. In last 5 matches, she scored 18 runs and took 3 wickets. Last game she scored 9 runs and took 2 wickets and contributed 27 points. 85.37% of the users have selected her. Nida Dar: She scored 1 run and took 1 wicket in the first T20 and contributed 23.5 points. 63.64% of the fantasy players have chosen her in their dream11 team. Natalia Pervaiz: In last 4 T20s she scored 24 runs and took 2 wickets. In last game, she contributed 4 points and scored 4 runs. 10.89% of the users have taken her. Pro-Tips: Try to make a combination of the above players as all players are important players. Nashra Sandhu: Sandhu scored 6 runs and took 2 wickets in last 4 matches. Last game she contributed 3.5 points and scored 1 run. 46.58% of the users have taken her in their teams. Daina Baig: Baig scored 2 runs and took 2 wickets and contributed 25 points. 80.05% of the users have chosen her in their fantasy teams. Sugandika Kumari: Kumari took 3 wickets in the last inning and contributed 37 points. 77.15% of the users have selected her. Oshadi Ranasinghe: Ranasinghe took 1 wicket in last game and contributed 12 points. 6.3% of the users have selected her. Pro Tips: Try to make a combination of the above players. The last match was a close encounter and anything could happen but Pakistan took all the glory. Our Astrology Department predicts that Sri Lanka Women will win the Match. The team winning the toss will love to bowl first and our astrology team predicted that Sri Lankan girls will win the toss and they will ask Pakistani girls to bat first. Conclusion: Winning and losing is a part of the game we provide detailed stats of every match so that you can win every match. This is what we have in Today Dream11 Fantasy Cricket Prediction PK-W v SL-W 2nd T20. You can subscribe to our notification so that you don’t miss any update if there is any change in the team at last moment. GOODBYE!